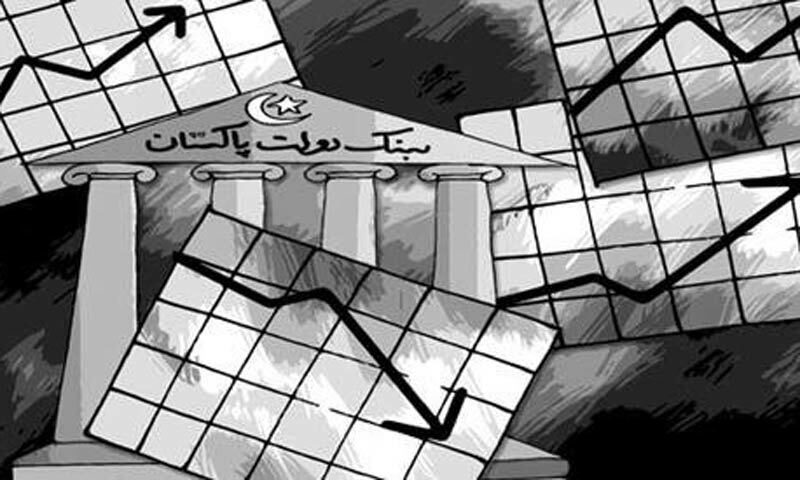 KARACHI: The State Bank in its annual report (2012-13), issued on Wednesday, projected the economic growth rate of 3 to 4 per cent for this fiscal year which looks more closely to the IMF projection than government�s annual plan. The government has projected gross domestic product (GDP) growth at 4.4pc while the IMF says it could be 2.5 to 3pc in 2013-14. The report noted that real GDP growth in fiscal year 2013 was 3.6pc, compared with 4.4pc in fiscal year 2012. For the first time, the central bank calculated the adverse impact of war on terror on Pakistan and held the war responsible for many ills in economy. �The actual economic cost of this war on Pakistan is significantly higher than CSF (coalition support fund) inflows,� said the SBP report. In addition to the loss of human life, the war has deteriorated law and order situation in the country, which in turn has adversely affected investment climate; caused production loss due to frequent interruption in economic activities; diverted resources to enhance security; encouraged manpower and some businesses to migrate out of the country; and adversely impacted revenue collection by the fiscal authorities, said the report. The report said higher than anticipated CSF inflows, and modest growth in workers remittances reduced the current account deficit to 1pc of the GDP in FY13 from 2.4pc in the previous year. However, it maintained that despite favourable developments, growing security concerns and persistent structural weaknesses continue to hamper economic growth. However, growth in agriculture is likely to remain below target of 3.8pc as rains damaged the upcoming rice and cotton crop in Punjab. The FY14 budget envisages a fiscal deficit at 6.3pc of the GDP which assumes a Rs120bn inflow under 3G licences; a 27.8pc growth in FBR tax revenues; Rs127bn reduction in subsidies (to Rs240.4bn against Rs367.5bn incurred in FY13); and a combined provincial surplus of Rs23.1bn. The growing fiscal weakness continues to exacerbate Pakistan�s structural problems, said the report, adding that the policy focus on financing the increasing fiscal gap leaves little time (and resources) to address problems in the energy sector; build and maintain the country�s physical infrastructure; implement a focused debt management strategy; enhance substandard social services; improve law enforcement; curb corruption; and remove other impediments to long-term private investment. �The stagnant tax-to-GDP ratio (one of the lowest in the world) is the biggest impediment to a stable macro economy, which is required to deliver higher economic growth,� said the report. Without political will to increase tax collection in a more equitable manner, fiscal consolidation is likely to remain elusive, as was the case in FY13, it said and added that like revenues, slippages on the expenditure side are challenging the fiscal authorities. The central bank suggested that energy sector should be facilitated by a single ministry. The report said that the misallocation of natural gas must be urgently addressed. �This is likely to be facilitated by a single ministry of energy, instead of the Ministry of Petroleum and Natural Resources (which allocates gas) and the Ministry of Water and Power (which has shifted power generation to furnace oil, as it was unable to secure adequate gas allocations). The energy shortage appears to be government�s policy priority, it said and added that this is required, since around Rs1 trillion has been utilised to pay-off power sector circular debts and untargeted power subsidies in the last two years (FY12 & FY13).